The previous idea on the EURGBP pair was published on the 26th of June. At press time, the euro was trading at 0.8798. Given that a W-model had appeared on the weekly chart, we recommended keeping 0.9083 in your sights. Cycles were expecting a fall to 0.8652 by 10/07/17 followed by growth to 0.9081 by 15/08/17. The price kept trading above 0.8719. After briefly consolidating, the euro rose against the dollar by 6.45% to reach 0.9307. After hitting a one-year high, the euro receded to the July low. Sellers completely reversed the growth from 0.8743 to 0.9307 without any rebounds. On Friday, trading on the crosses closed down. The pound’s growth against the euro was facilitated by European Council president Tusk’s announcement that the heads of the European Union states had approved plans for the second phase of Brexit talks. So, what do we have now? The price has corrected by 50% from the drop from 0.9307 to 0.8746. A double top has formed at the 50% level. On Friday, the daily candlestick closed to form a bearish engulfing pattern. After that, the price should recede to the TR line at 0.88 without stopping. I beg to differ. I reckon the price will return to the TR line by way of a W-model. If, from 0.9307, we consider the formation of a three-wave downwards correction, the target for sellers is at the 0.8624 mark. 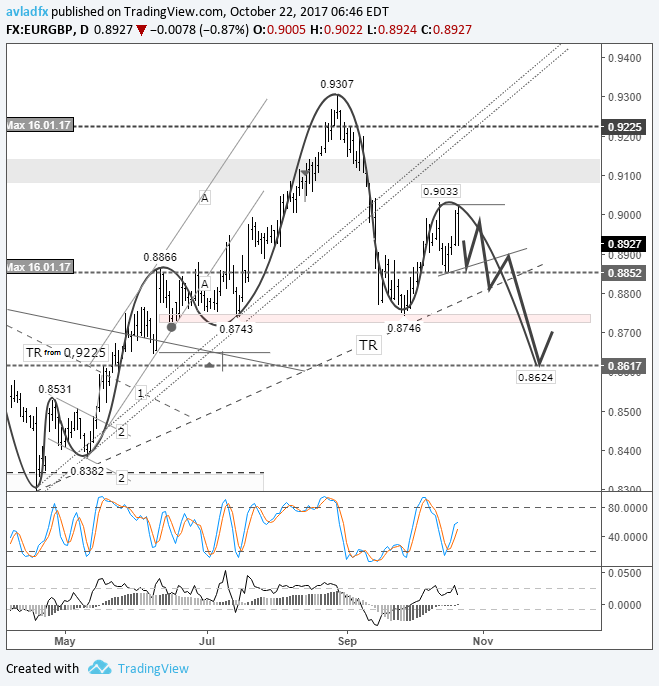 A drop on the EURGBP pair to 0.8856 will be taken as a signal that this forecast is on track.